Argan oil shampoos and conditioners are becoming increasingly popular among both men and women who are looking for good quality products that will aid them in their quest for healthier hair. Still, choosing a shampoo or a conditioner that has argan oil as its main ingredient but is full of chemical preservatives and other harmful additives should not make the best choice for you. So, here I have selected the most natural options of the best argan oil shampoo and conditioner based on the products’ top reviews, ingredients and good quality. Pura D’ Or Hair Loss Prevention Argan Oil Shampoo is a popular good quality natural product that is suitable for daily use. It is specialized for hair that is thinning, damaged and color treated. This is a gentle Dr Trusted hypo allergenic formula, which according to the company, works by first nourishing the hair follicles, promoting healing and then strengthening hair, increasing circulation and boosting hair growth. It is also recommended that continued use of this cruelty free product will stop any additional hair loss. It comes in a 16 ounce bottle and contains effective hair loss ingredients such as Biotin, Niacin and DHT blockers as well as other natural components, such as coconut derivatives, argan oil, tea tree, black seed oil and vitamins H and E, that detoxify and heal irritated and unbalanced scalp, leading to healthier stronger hair. This natural argan oil shampoo contains no sulfates, DEA, parabens, artificial fragrances or other harmful chemicals. It is good for all types of hair and suitable for both women and men. The Pura D’ Or Company has been creating trustworthy and successful products in the USA for years now. Several users state that it slows down hair loss. Their hair feels more hydrated and softer. They like the fact that it leaves their scalp fresh and clean. Some users say that their hair feels thicker when using this shampoo. 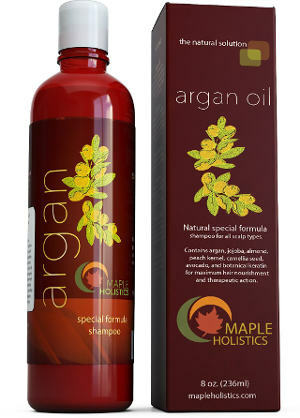 The Maple Holistics Argan Oil Shampoo is another popular and good quality natural and cruelty free shampoo which is good for all hair types including color dyed hair. It is made in the USA, comes in a 8 ounce bottle and is free of sulfates, artificial fragrances, colors and other unhealthy additives. A full money back guarantee is also offered by the company. This shampoo is good for both men and women. Among its ingredients are argan Moroccan oil, botanical Keratin, jojoba oil, avocado oil, almond oil, peach kernel oil, camellia seed oil as well as natural vanilla and honey. They experience fewer tangles and more manageable hair. Their hair feels stronger and softer. A little of this product goes a long way making it an excellent value. It has a very nice scent. The Pure Body Naturals Argan oil Shampoo contains pure Moroccan Argan oil and is suitable for all hair types including color treated hair, restoring some of the damage that coloring and hair products can cause. It comes in a 16 ounce pump bottle and, according to the company, this therapeutic shampoo will make your hair shiny, healthy and more manageable, minimizing frizziness. It also soothes scalp irritation and dryness, containing great emollient and nourishing natural ingredients including vitamins A, B1, B2, D and E, proteins and essential fatty acids. It is said to be hypoallergenic and is followed by a full money back guarantee. It leaves hair less frizzy and softer. Doesn’t leave hair feeling and looking greasy or oily. The Majestic Pure Argan Oil Shampoo comes in a 16 ounce pump bottle and is vitamin enriched. It is rich in proteins and contains carotene and essential fatty acids to promote hair restoration and soothe irritated and dry scalp. This gentle formula which helps your hair to look healthy and shiny is sulfate free and contains no harsh chemicals. It is appropriate for both women and men and is backed up by the company’s 60 day full money back guarantee. It helps color treated hair keep its color longer. Hair feels softer and more manageable. Leaves hair and scalp feeling fresh and clean. This Pura D’ Or Scalp and Dandruff Argan Oil Treatment Shampoo is a good quality natural product that comes in a 16 ounce pump bottle and is free of sulfates, parabens or other harsh chemicals. In fact, the only mild preservative it contains is Phenoxyethanol which is considered safe when used in small quantities. This shampoo is good for controlling itching, flaking and scaling. It is soothing and balancing to the scalp but at the same time it keeps your scalp and hair moisturized. Some of its ingredients are argan oil, tea tree oil, lemon oil, biotin, B complex vitamins, lactic acid, vitamin E and others. It resolves itchiness and irritation. Deals with inflamed scalp and controls dandruff. Reduces oiliness without drying out the scalp. Does not leave an oily residue behind. Hair feels clean and soft. This Pura D’ Or Argan Oil Conditioner is the ideal accompaniment to either of the Pura D’ Or Argan Oil Shampoos previously reviewed. It is 99% plant based and contains gentle premium ingredients which make hair strong and shiny. It soothes and nourishes both the scalp and hair, controlling frizziness. According to the company, this free of cruelty product heals, hydrates and repairs damaged hair without weighing it down or adding buildup. It is pH balanced, free of harmful chemicals and comes in an 16 ounce bottle. It is also suitable for all types of hair and for everyday use. It contains vitamins A, D and E, argan oil, lavender extract, coconut and vegetable proteins as well as other natural ingredients. Users feel that their hair has more shine and is softer than when using the shampoo alone. It doesn’t leave it feeling greasy. When it is combined with the shampoo, it tends to prevent hair loss for some users. In conclusion, if you are looking for the best Argan Oil shampoo and conditioner, then one of these top popular selections may be the ideal product for you.